Most people store their bikes when winter arrives. But wouldn't it be great to have a bike that's made for the snow? MCCALL, Idaho — Most people store their bikes when winter arrives. But wouldn't it be great to have a bike that's made for the snow? More and more people are taking advantage of technology that lets them surf the snow on their motorcycle, and the world of snowmobiling may never be the same. "This is a whole different beast and it's here to stay." says Polaris ambassador Russ Weibye. The Timbersled is a dirt bike transformed for the winter: A ski replaces the front wheel, and a custom snow track replaces the rear. "You can use it in the summer like a dirt bike and switch it over with the snow bike kit and in a few hours have it done," says Weibye. A two in one package that does away with the need for a snowmobile that you have to store all summer. Weibye says it takes less than a day for an experienced motorcyclist, like our Roland Beres, to get the hang of it. ! And he's right. The hardest part, Beres learned, is not putting your foot down every time you stop. If you do, you're bound to take a spill. 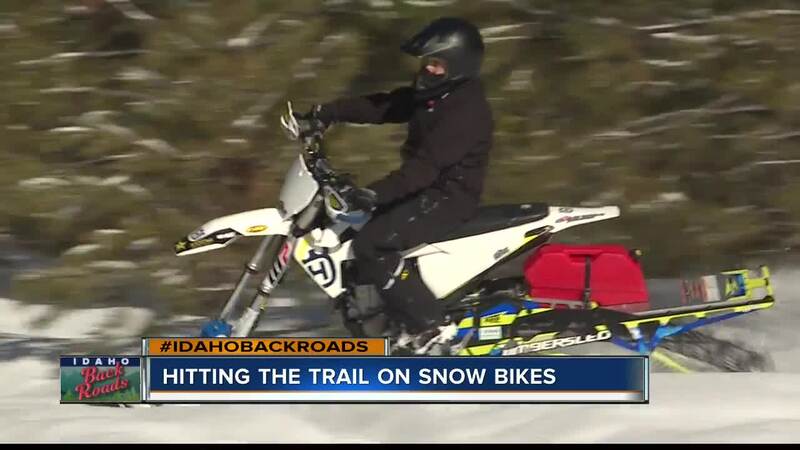 The technology of the Polaris Timbersleds is incredible, but perhaps more incredible is the fact this technology really got it's start right here in Idaho. Before it was sold, Timbersled started out as a small Treasure Valley company called 2 Moto. "2 Moto was one of the starters of it and it's been fine tuned every year," says Weibye. Polaris now sells units between $3,000 and $6,000 on top of the cost of the bike, but they're way less than a snowmobile, and more versatile. "It's in the X Games now having races in X Games and it's bringing in a whole new level of riders out there. People who want more versatility, " adds Weibye. It's actually most at home in deep snow where you can lean and carve, and when the snow is gone, you can put the tires back on and ride the very same trails the rest of the year. More proof that Idaho is the home of the snowbike: Weibye says Carl's Cycles in Boise is the largest Timbersled dealer in the world.